VANCOUVER, May 10, 2018 – So you’ve read the case study, you’re bent over your laptop, and you’re ready to answer the questions on your exam in the chartered professional accountant professional education program (CPA PEP). I would wish you luck but, to be honest, what you need is a strategy, not luck. If you’ve been following my blog posts, you already know that, just like you, I’m working my way through the program and I’m doing well. 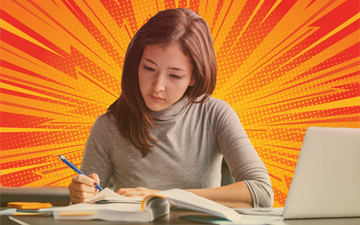 So here are five practical tips for actually writing your CPA PEP exams, from someone who has been there, done that. 1. Move on if you’re stuck. Core 1 and 2 exams have a heavy focus on multiple choice questions (75 per cent) and one case study (25 per cent). You might have around two minutes to answer each MCQ on average, so dilly-dallying is a threat to whether you will complete the exam. If you are stuck on an MCQ for more than a couple of minutes, leave it for later and come back to it if you have the time. If worst comes to worst and you’ve left a few questions unanswered, rush through the unanswered ones at the end of the exam and answer with your best guess. 2. Don’t open the CPA Handbook or Income Tax Act. It’s likely that, somewhere in your answers, you will have to refer to the Handbook or ITA, and accredit an accounting or tax rule to its source. But if you open the Handbook or ITA at any point to do so, you are wasting precious exam time. You either need to know exactly to what you are referring, or simply state something like “as per IFRS, revenue should only be recognized when …” and move on. I have never referenced a specific section in the Handbook and I’ve passed with distinction so far. 3. Manage and manipulate your time. There are opportunities in any CPA exam to “gain” time. By this I mean answering some questions faster than the CPA program expects you to, giving you more time for others. Personally, I feel the CPA allows too much time for MCQs and too little for case studies. In this regard, I always do the MCQs first and much faster than the CPA expects. For example, I typically finished the Core exam MCQs in around 150 minutes rather than 180 minutes, giving me an additional 30 minutes for the case study. This tactic is easiest in Core 1 and 2, when there are a lot of MCQs, but it’s less easy in the electives, where there are more cases. 4. Always use pros and cons. You can get easy marks in any CPA exam simply by discussing the pros and cons of alternatives. Nearly every case asks you to analyze alternatives and, while the quantitative analysis might be tricky, the qualitative analysis should be easy marks. Always list three pros and three cons for each alternative. This should take no longer than a few minutes and is a sure-fire way to tick a few boxes. 5. Tell them what they already know. Another easy way to get marks is by simply telling markers what they already know. This is usually done in the “issue” phase of the CPA way. If you simply summarize and regurgitate what the problem at hand is at the beginning of your answer, as well as writing a few issues that you need to analyze, you will undoubtedly earn some easy marks. Sometimes you might have to get fancy and put it in a SWOT analysis but all you are really doing is taking case facts and organizing them in such a way that the marker can see you understand the case and how to approach it. I don’t really have much advice for after the exam other than making sure you upload your exam file before you get slapped with a $200 fine. Now’s the time to discuss with your peers how crappy the exam was and to relax. Treat yourself to a lunch out and take it easy for two weeks until you get your mark. There’s no point in worrying about something outside of your control, so why bother? If you are taking back-to-back courses, you will likely only get about three weeks off, so use this time to re-energize. Don’t study and don’t worry about the CPA program at all for these weeks. Heck, now’s a good time to take a vacation! Andrew Knapman lives in Vancouver, B.C. and is a student in the CPA Professional Education Program through CPA BC. The views expressed in this guest blog are his own. Connect with Andrew through his LinkedIn profile and follow him on his journey to becoming a Chartered Professional Accountant through future blog postings on Canadian Accountant. You’re in the CPA examination room. How should you approach your PEP exam to ensure your success? The CPA PEP core modules: What should you focus on?